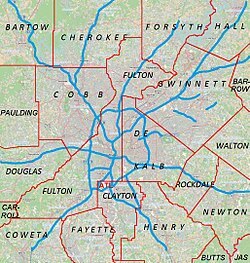 Ben Hill is a neighborhood in the southwestern part of Atlanta, Georgia, United States. Ben Hill is a predominantly black community with many black-owned businesses. Ben Hill is located within the city limits of Southwest Atlanta. Its boundaries start south at Welcome All Road, expand North to Fairburn, and ending slightly before you reach Unincorporated Fulton County right before you reach Cascade Road. Its western boundaries start at Campbellton Road at Sand Creek and extend East to Hogan Road and ends slightly after Continental Colony Elementary before entering the city of East Point. The Ben Hill area was first settled in the 1820s and was originally known as Mount Gilead Cross Roads. The Judge William Wilson House is located in Ben Hill, one of a handful of antebellum buildings in Atlanta. The Atlanta Preservation Center placed the NRHP-listed house on its List of Most Endangered Historic Places in 2001. Greenbriar Mall is the most recognizable figure in this community. The skating rink from the movie 'ATL' is based on the historic Jelly Bean Skating Rink that was once located in this community. Now closed, the movie was shot at Cascade Family Skate rink in Adamsville. Jelly Bean has closed down, but still remains one of Atlanta's top Skating Rinks of all time. Jelly Bean is remembered as "The Master Of All Roller Rinks" in Atlanta. With Cascade Skating Ring following behind. Jelly Bean is the Roller Ring that put Ben Hill on the map in the late 1970s. Jelly Beans was not in Ben Hill, it was on the Northside. In the 1970's it was called the Greenbriar Skating Rink. It was on Stone Road, across from the old Arlington Schools campus. Before it was a skating rink it was a bowling alley. Ben Hill is home to three elementary schools; Continental Colony, Deerwood Academy,and Fickett. It is also home to one middle school; Ralph Bunche. Ben Hill has a community park, Ben Hill Park, which includes a large recreation Center, 3 ball fields and two tennis courts and outdoor basketball courts. Ben Hill holds its annual reunion, Ben Hill Day, every year on the last Sunday in July. Ben Hill Day was started by lifelong citizens of Ben Hill by the name of Mr. Sherard Bunkley. This event celebrates the lives of all fallen friends and family members of the Ben Hill community. Also it is a reunion for the Ben Hill citizens which has grown to 30,000 in attendance.